As Catholics, we believe that Mary was assumed into Heaven both body and soul together, where she was crowned in glory Queen over all things. Mary is the only human to be given this favor because of her perfect state of purity, being free from all stain of sin. The Assumption of Mary is cause for great celebration within the church. In the United States it is celebrated on August 15th and is often declared with processions and festivals with much fanfare. We find homilies on the Assumption going back to the sixth century. In following centuries, the Eastern Churches held steadily to the doctrine, but some authors in the West were hesitant. However, by the 13th century there was universal agreement. The feast was celebrated under various names (Commemoration, Dormition, Passing, Assumption) from at least the fifth or sixth century. Today it is celebrated as a solemnity. Scripture does not give an account of Mary’s Assumption into heaven. Nevertheless, Revelation 12 speaks of a woman who is caught up in the battle between good and evil. Many see this woman as God’s people. 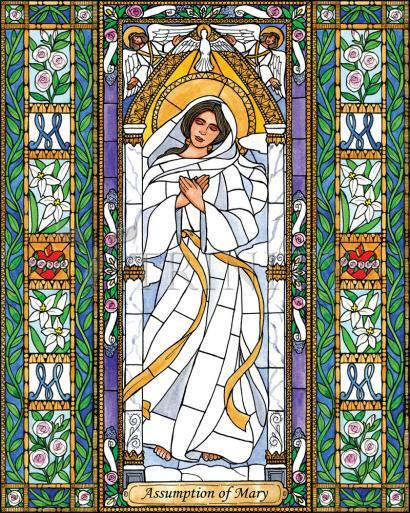 Since Mary best embodies the people of both Old and New Testament, her Assumption can be seen as an exemplification of the woman’s victory. Furthermore, in 1 Corinthians 15:20 Paul speaks of Christ’s resurrection as the first fruits of those who have fallen asleep.